Best way is email: contact_2600daptor@yahoo.com I respond to all emails. If you don't get a reply within 24 hours, it may have been flagged as spam - check your spam folder. You can post on the AtariAge threads below if a general question, or if order specific, message me directly (I am AtariAge user "dualcam"). but please note I don't get on social media much (mostly only when I get notice someone has posted there). Win 8.1: Click Search in the side menu, enter "USB" and click "Set up USB game controllers"
Win 10: Click Run in Start Menu and enter "joy.cpl"
Select the adapter in the list and click Properties button. Check the various controller functions. Try a different USB cable or plug into a different USB jack. The 'daptor might be going into firmware update mode. 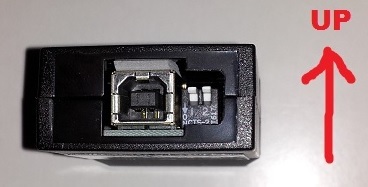 If a button/switch connected to internal terminal 4 is on when the USB is being plugged in, the 'daptor will go into firmware update mode. If so, just unplug and replug the USB, ensuring any such button or switch is off. Once the LED starts flashing, the 'daptor has booted up and any button/switch on terminal 4 can be used freely without the 'daptor going into firmware update mode. Be sure you have Stella vers 3.4 or later (3.6 for 'II)! The 2600-daptor needs to be connected before Stella is opened. Trying closing and reopening Stella. Verify operation in Control Panel->Game Controllers as noted at top of this Help section. Check Stella Options->System Logs (“stdout.txt” file in Stella 3.4) for “2600-daptor“ listed under “Joystick devices found:”. For 'II, check you have the switches set to the correct mode for the controller. See the individual adapter pages for their switch settings. Is the Paddle controller worn? Try using them in a real 2600 if you have one. Paddle A is susceptible to wearing out as it used exclusively for one-player games. Paddle B is often still good. Try Paddle B in a two-player game or use the swap Paddle option in Stella (Options->Game Properties->Controller->Swap Paddles) that makes Paddle B player one. You can swap the pots if you have a bad one. I found controllers that have connectors inside so the wires just plugged on making it easy. But I have also foud others with the wires soldered on. Another possible source of this problem - the 9-pin connector could have worn or dirty contacts. Need to install evdev-joystick found here. See the included Readme.txt file for instructions. Thanks to Stephen @ Stella for providing this. 2600 D9's shipped in Dec '18 thru Jan '19 need to have their firmware updated to the 2/01/2019 version. 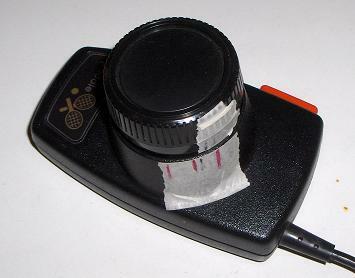 A real 2600 only uses about 10% the paddle controller’s range of motion. The outer red lines on the tape in the below pic mark the full range used on a real 2600. The 2600-daptor has been calibrated to give this same range under Stella. You will want to set Joystick Deadband to 0.0. If using a GUI, try right-click on the game system, Properties, Controllers tab to find this setting. Joystick Saturation will also affect paddle operation - try 1.0. You want to just set this on individual game systems, as opposed to global.